Radical cystectomy with pelvic lymphadenectomy and urinary diversion is the standard of care for muscle-invasive urothelial bladder cancer, performed via both open and robotic surgical techniques. Regardless of surgical approach, radical cystectomy and urinary diversion is an extremely complex operation associated with considerable postoperative morbidity, many times directly related to the urinary diversion. Important preoperative concerns before radical cystectomy include patient optimization and education, bowel preparation, parenteral antibiotics, venous thromboembolism prophylaxis, as well as various urinary diversion considerations. Myriad urinary diversions are discussed in detail, including both non-continent and continent urinary diversions. 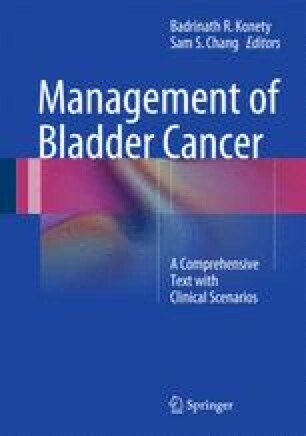 Essential factors regarding selection of specific urinary diversion type are reviewed including quality of life issues such as continence, patient satisfaction, and sexual function. Critical perioperative issues are elucidated including anesthetic considerations and general postoperative strategies including use of a nasogastric tube and nutrition. Finally, open and robotic techniques for radical cystectomy and urinary diversion are reviewed with particular attention to both the bowel and ureterointestinal anastomoses. Open techniques for urinary diversion are well-established and robotic urinary diversion generally follows the same surgical principles. Regardless of open versus robotic approach or diversion type, meticulous attention to surgical detail is essential in efforts to minimize significant postoperative morbidity.